Weekend brunch is always a good idea. In Union Square, take your brunch around the globe with options like Masala Fried Chicken & Technicolor Waffles, Uova e Pancetta, or Sabich. Let your tastebuds travel the world with authentic international brunch offerings from Babu Ji, Boucherie, Nur and Tarallucci e Vino. For a taste of the the Middle East, head to Nur for a little haflah, where beautiful mezzes and small plates arrive in a constant flow as the meal unfolds. The restaurant's brunch service launches this month with a prix fixe $42 menu including Turkish Coffee and Moroccan tea service - specialty modern Middle Eastern brunch cocktails are an additional (and worth it) charge. The cuisine is inventive, modern, bold and playful, where every bite introduces a new flavor. The seasonally inspired menu will rotate, and Nur is starting with a full vegetarian offering including Eggplant Carpaccio, Fattoush Salad, Jerusalem Bagel with Kubbeh Nayeh Herb Salad, Yogurt with Tershi and Harissa, Sabich with Green Tachini like you've never tasted, and of course dessert. B'tayavon! Head to France at Boucherie: a French Brasserie with a timeless, contemporary joi de vivre (joy of living). The food is not the only thing your eyes will be feasting on. 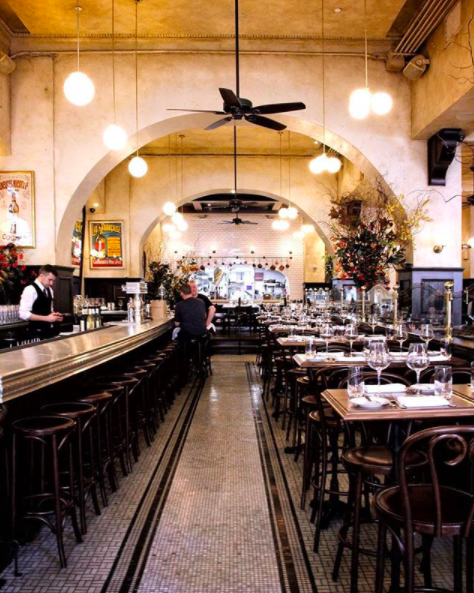 The restaurant's interior is surrounded by walls of majestic wood-framed mirrors and original Belle Époque posters, while table seating varies from pristine white marble to wood bistro tables and cozy burgundy leather booths. While the menu is extensive, take your pick at some French classics; Steak Tartare, Mousse de Foie Gras, Salade Niçoise, Pain au Chocolat, Eggs Norwegian or Le Croque Madame. To accompany your delicious meal, order a cup of hot coffee/tea or perhaps even champagne. Now pick up your café au lait and pose for that fabulous Instagram picture. Bon Appétit! This simple Italian coffee bar and restaurant is the ideal spot for a no frills brunch to catch up with your crew. At their flagship space in Union Square, the chefs make all their pastries and desserts fresh on site. As for the space, the inside offers a rustic setting while the outdoor patio is ideal for a warm breezy day. Do you feel like you're in Italy yet? The menu will take you there: house-made brioche toast with bananas, walnuts and mascarpone, Burrata y aceto balsamico, Salumi e Formaggi, or a Caprese Panini. Pair your meal with an Aperol Spritz or Negroni Sbagliato, Italian wine or a specialty brunch cocktail. Buon Appetito! Shall we take a trip to India now? Known as "not your typical Indian joint," Babu Ji highlights traditional Indian street food, cross-regional curries, and tandoori dishes with a twist. The restaurant itself is two levels: the top floor illuminated with natural light and offering a self serve beer fridge, while the bottom floor has a sultry, underground vibe. On the menu you'll find items such as Masala Fried Chicken & Technicolor Waffles, Nutella-stuffed naan cakes, Colonel Tso’s Cauliflower, and Naan Pizza. The cocktails certainly don't fall short from the rest of the menu, with names like Raj Kapoor, Don't Tell Auntie, and Chaat Cobbler. We won't give away exactly what's in them so you might just have to go taste for yourself. बॉन एपेतीत!